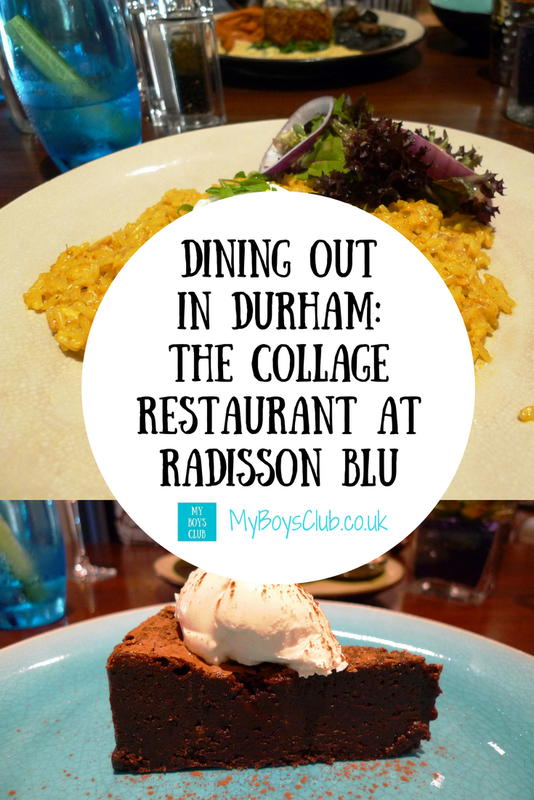 When you have both lived and studied in a city, like me and hubby did in Durham, and you are presented with the opportunity to return and review a snazzy restaurant, how lucky were we that we had babysitters for a Friday evening and we could go and enjoy a child-free meal at the new Collage Restaurant at the Radisson Blu Hotel, in Durham. Located alongside the scenic River Wear, the Radisson Blu Hotel, Durham is at the heart of the historic city. The four-star hotel has 207 bedrooms and suites but also a restaurant where you can experience a unique twist on the classic British Brasserie, as a hotel guest or just as a diner as you don’t need to be staying at the hotel to eat there. 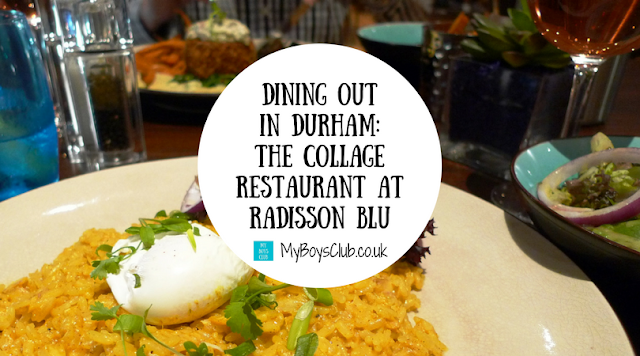 The Collage Restaurant at Radisson Blu in Durham is less than 20 miles from Newcastle and the train journey takes just 10 minutes. 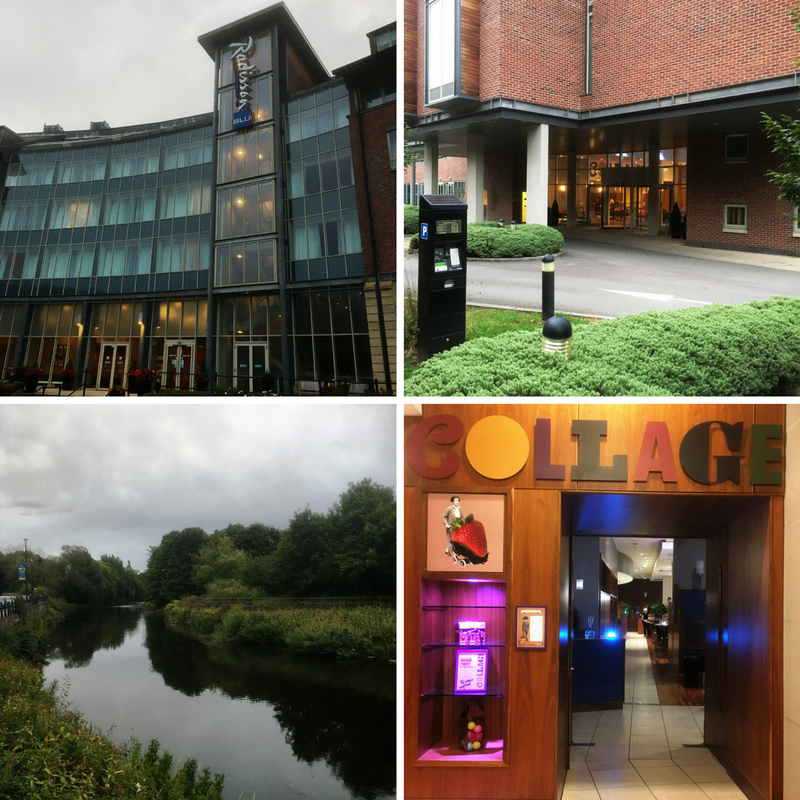 We drove but the train station in Durham is just a 5-minute walk from the Radisson Blu - so that’s an option too. 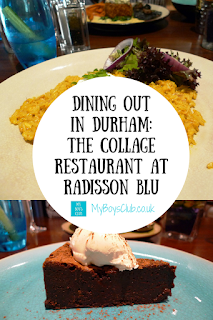 The restaurant at Radisson Blu is now called 'Collage'. 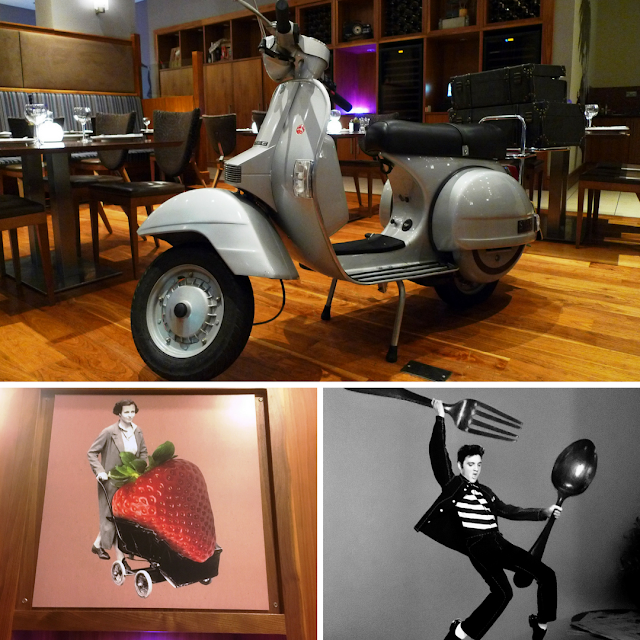 It is inspired by Peter Blake - often called the "Godfather of British Pop Art." The English pop artist is best known for co-creating the sleeve design for the Beatles' album Sgt. Pepper's Lonely Hearts Club Band; the cover of the Band Aid single "Do They Know It's Christmas? "; the Live Aid concert poster; and he also designed the 2012 Brit Award statuette. The décor is littered with quirky bric-a-brac, drawings, and paintings and there is also a silver moped and a bike in the middle of the restaurant, honestly, see pic below!. It’s quirky and not too dominant but you definitely do notice it. I also loved the lamps on the tables. We arrived and parked in the car park at the rear of the hotel where there are ample parking spaces. The restaurant is on the ground floor, not far from the hotel reception desks and is very easy to find. 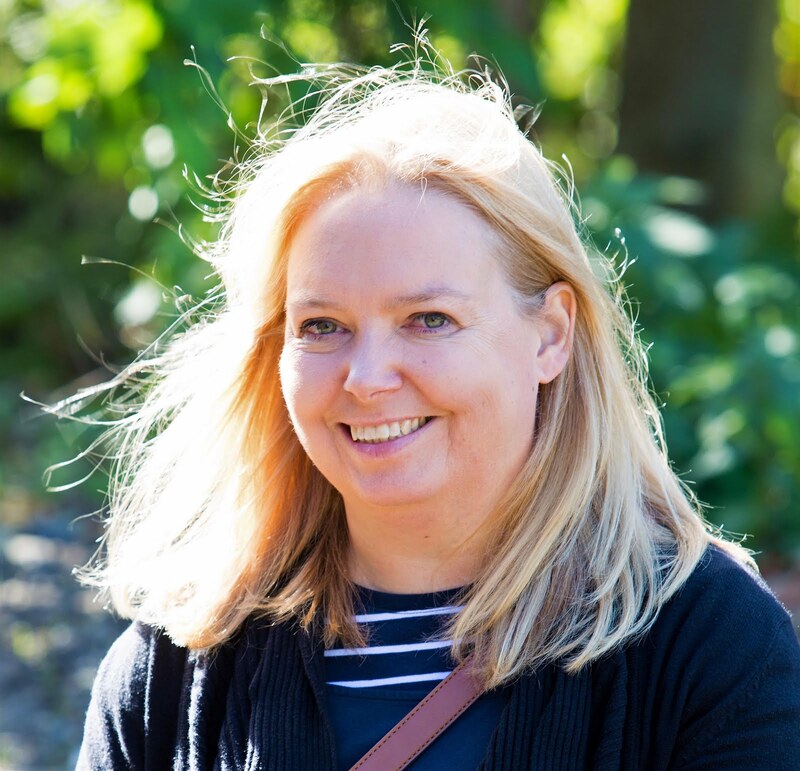 After a quick walk along the river, we headed straight to the restaurant and were shown to our table- which not only had a window view but from where we could also see Durham Cathedral. We were offered a bottle of wine as part of the review and opted for a Zinfandel Rose (£21), however, if you are not a wine drinker then you can also choose from a selection of cocktails and craft beers. Water was also brought to the table served with cucumber to keep it fresh tasting. We enjoyed nibbles of olives (£3.50) which arrived with fresh bread before our actual starters arrived. Both fresh and tasty. and hubby the prawn cocktail with rye bread (£8). Both were delicious and I’d happily order either again. The avocado was just soft enough and paired with the tomato and topped with chilli made for a really tasty dish with a little spice. The prawn cocktail was as a prawn cocktail should be, creamy, plenty of prawns and also very fresh tasting. We took quite a lot of time choosing a main course. In the end, we opted for a fish dish each but there are plenty choices for people wanting to eat meat (as you would expect) but also for vegetarians too with a Chickpea, lentil, and kidney bean burger; butternut squash barley risotto; and roast spiced cauliflower dishes on the menu. The restaurant says it offers everything from sumptuous steaks and smoked haddock kedgeree to a classic British cheeseboard. As the kedgeree was mentioned on the restaurant's website I opted for that, over my traditional sea bass which I seem to pick everywhere I go. The gluten free dish of Smoked Haddock Kedgeree (£15) was delicious. The smoked haddock gave it a distinctive fishy taste without being overpowering. But it also had a really creamy texture too. I also ordered a dressed green salad (£4) to eat with it. Hubby opted for the smoked salmon and cod fish cake with buttered spinach, beurre blanc & a lovely homemade tartar (£16) and he added sweet potato chips (£3.50) and garlic flat mushrooms (£3.50) as sides. The fish cake was all fish, no additional potato filling, pretty large too and very tasty. I think I’ll choose this dish next time I go. 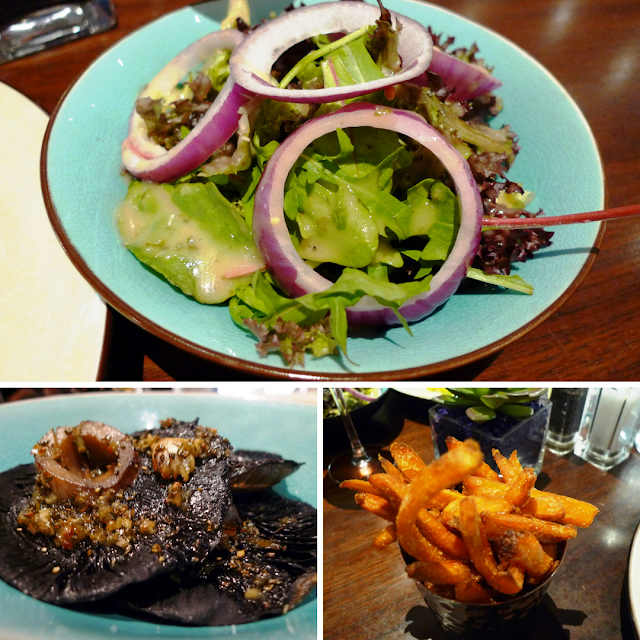 The side dishes were amazing too. Three big Portobello mushrooms, very garlicky and juicy and the sweet potato chips, very crispy, are probably the best I’ve eaten anywhere (Yes I tried all of the hubby’s food too). I was feeling rather full by this stage but I’d already spotted the super-rich flour-free 70% chocolate cake with crème fraiche (£7) on the menu. This gluten-free cake was definitely going to be my dessert. Hubby was torn between the ice creams which he said looked amazing as he’d watched them being served to other diners and the Williams Bon Chrétien pear poached in white wine and spices, served with ginger cream (£6). He opted for the poached pears and it was such a light, refreshing dish – very tasty but perfect to eat after quite a lot of food. Definitely, one to consider in the future. The food and service the whole night was impeccable. The waiting staffs were attentive, friendly and helpful with suggestions. And it wasn’t just with us because we were there to review the restaurant, but they were like this with all of the other diners too. In total, our meal which included nibbles, starters, main courses, side dishes, dessert and a bottle of wine would have cost us £94.50. The food was absolutely delicious, portions are very generous and with a riverside location with plenty of parking and close to the train station then it’s a restaurant I’d certainly recommend and return to. What would you have chosen from the menu? Disclosure: We were invited to enjoy a complimentary meal for two in exchange for an honest review.